Tool sets are an awesome gift for children since they’re always watching how their parents are fixing things around the house. Children are always watching how their parents are fixing things around the house and doing various projects that involve building. Therefore, toy tool sets make for excellent gifts. Often times, your little one will want to join in, however, it’s usually pretty dangerous – and that’s where pretend tool kits come in. Your child can play with toy drills, saws, screwdrivers, and more to imitate their parents and have fun. If you’ve been struggling to find a tool set that you think your little boy or girl would like, you’ll want to check out our review of what the best options have to offer. 3 Learning Resources New Sprouts Fix It! 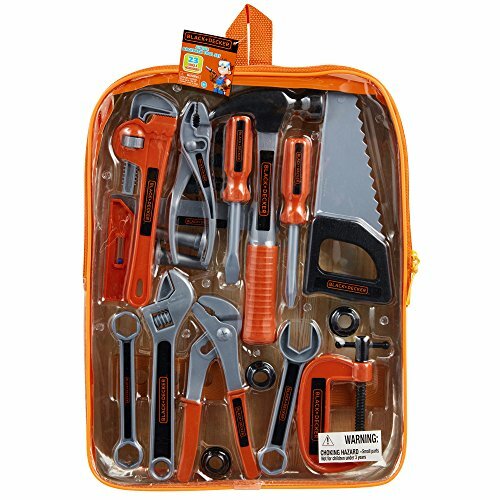 7 My First Tool Box by BLACK+DECKER Jr.
Children are able to play for hours by using the 19 different tools that are available in this set. It includes a pretend hammer, bolts, ratchet, screwdriver, and much more. We liked how they all have a realistic design. This is an effective way to get your child to role play more and use their creative thinking skills while playing. In addition to this, there’s a toy drill available that’s powered by batteries and makes realistic noises. As a result, the playing experience is a lot more immersive for children. Not to mention, it improves their auditory learning senses. While kids are holding the various tools and pretending to build things, their motor skills and coordination are able to develop as well. Kids are able to use this set to play with a lot of creativity due to the realistic design and sound effects. We liked how this tool set has been made specially for young children as all the parts are a great size for smaller hands to hold onto. As a result, your little one’s motor skills and coordination are able to improve greatly. 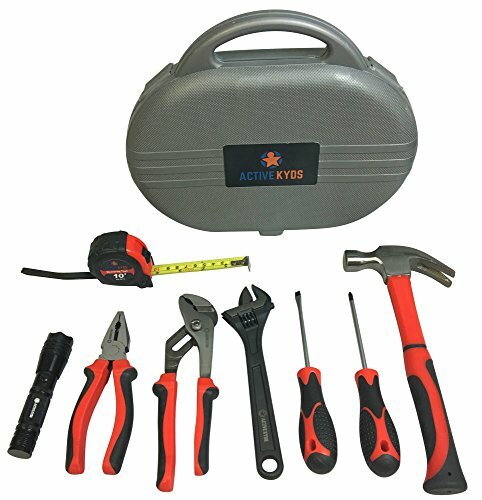 There are 11 pieces available in this set that include a tape measure, screwdriver, safety glasses, and more. All of the pieces have been made with a realistic design that kids have been loving. The realistic features help them to role play what they may have seen their parents doing with similar tools. Therefore, it can be an awesome way to improve your little one’s creative thinking processes. 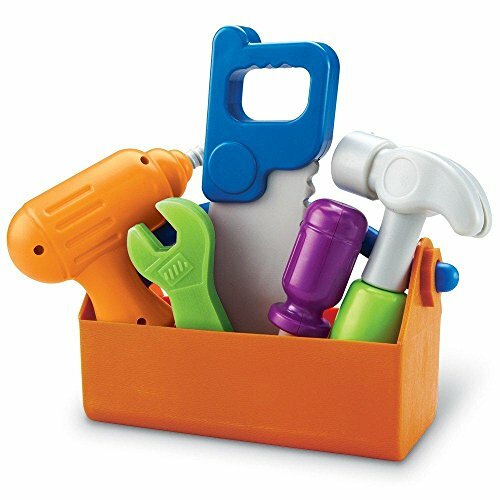 The size and design of this boys tools set ensures that kids can hold and use the tools with ease to play creatively and improve their coordination and motor skills. 3Learning Resources New Sprouts Fix It! Learning Resources‘ tool set is fantastic for toddlers. 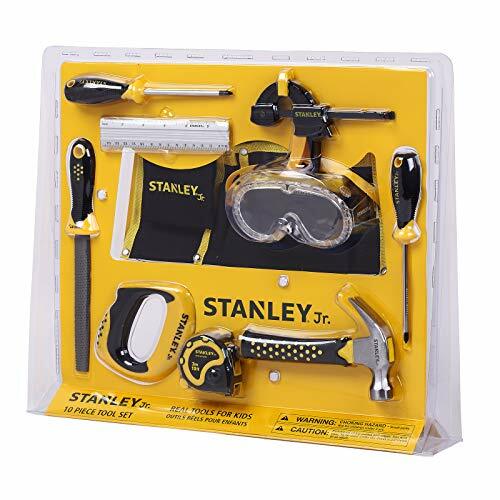 It comes with a pretend screwdriver, saw, drill, hammer, and a toolbox which have been made out of plastic materials that are safe. We were impressed with how toddlers can squeeze onto the drill and listen to how it makes sound effects. These are realistic sound effects that encourage children to play with the set in more creative ways. It also improves their auditory learning processes. In addition to this, toddlers are provided with a fantastic opportunity to develop their hand-eye coordination and motor skills since it’s such a hands-on playing experience. Toddlers have been having a blast playing with this set and being able to play imaginatively while also improving their coordination and motor skills. 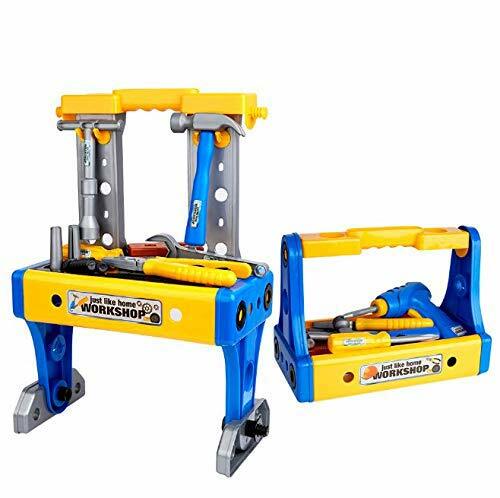 This tool set has been specifically made for older children because they have been made with solid steel materials. It includes pliers, screwdrivers, a tape measure, wrench, case, and a flashlight. Therefore, your child is provided with plenty of tools to keep themselves occupied for a long time. All of these tools have been created to be the perfect size for your child’s smaller hands to handle. As a result, their motor skills and hand-eye coordination are able to develop well. In addition to this, kids are encouraged to let their creative side flourish by making different things. This is a set that older children can use to become more familiar with how different tools work. Their motor skills and coordination are able to develop well too. Kids have a total of 40 pieces to play with and stay occupied for hours on end with this tool set. It has been made for toddlers which means that all the pieces have been created with safe plastic materials. We liked how it features an electric drill that has realistic sound effects. This is effective at making the playing experience more realistic and interactive for toddlers. Their auditory learning senses are able to benefit from this. Furthermore, the realistic features help toddlers to use the toys to play with more creativity. While handling the various pieces, your little one’s motor skills and hand-eye coordination are able to develop. Toddlers have been loving how they can use the realistic features with this set to play creatively for hours. We were impressed with how the range of nuts and bolts available in this set can be used in combination with each other. It allows kids to try out different combinations and be engaged for hours of play. With 52 tools and pieces available, your little one is provided with plenty to play with. We liked how the electric drill features sound effects and has a realistic design. These features help children to play with more imagination. The sound effects are also excellent for your child’s auditory learning senses. Not to mention, handling all of the different tools is a fantastic way to develop your child’s motor skills and hand-eye coordination. Kids have been loving the realistic designs and sound effects with this set as it gives them a more interactive playing experience to be creative with. 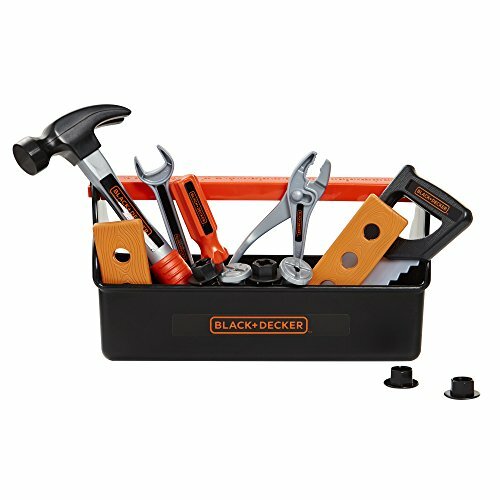 7My First Tool Box by BLACK+DECKER Jr. If you’re looking for a tool kit for your child who has never played with these kinds of toys, this option by Black+Decker would be a great choice. This is because it comes with 14 tools and other pieces. Therefore, there aren’t an overwhelming number of pieces for your child to be confused by. Instead, they can focus on having fun with the pretend saw, hammer, wrench, screwdriver, and more. While handing these tools, your little one’s motor skills and hand-eye coordination are able to develop greatly. Furthermore, they feel encouraged to use the toy tools to play in more creative ways. 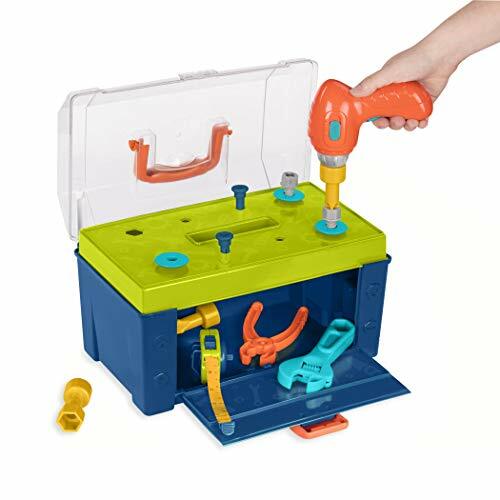 This is an awesome first-time tool set that comes with enough pieces to let kids play creatively and develop their coordination and motor skills. Kids are provided with an impressive total of 70 pieces with this set, which means that you can expect them to keep themselves occupied for hours on end. There’s a pretend screwdriver, hammer, wrench, saw, and more! We liked how they have made the tools with a realistic design. This makes the playing experience more immersive for children and enables them to play with the set in more imaginative ways. Furthermore, while they’re holding the different tools and pretending to build things, their motor skills and hand-eye coordination are able to improve greatly. Parents have also been glad to find that the materials include high-quality ABS plastics. With 70 pieces available, you can be sure that your little one is provided with plenty to play with and be creative for hours. 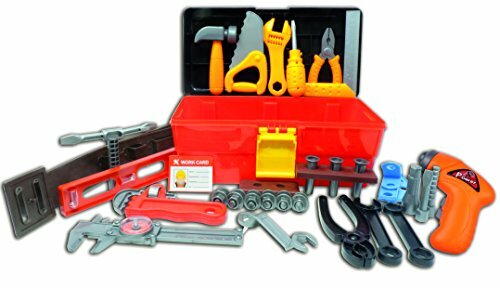 We were impressed with how this tool box set comes with pieces that have been specifically made for smaller hands. They have an ergonomic aspect to them that makes it comfortable for kids to hold onto. As a result, your little one is able to play with this set for hours without any discomfort. The hands-on playing experience is also a fantastic way for your child to develop their motor skills and hand-eye coordination. In addition to this, they love pretending that they’re using real tools which encourages them to play with a lot of creativity. This set can be a fun way for you and your child to pretend to build things and spend quality time together. This is a fun tool set that lets kids play for hours at a time in comfort due to the ergonomic design. 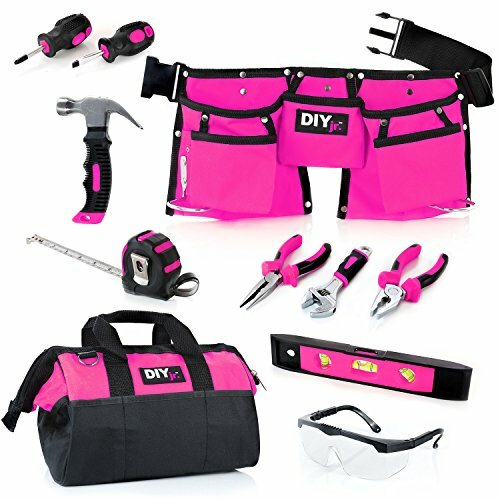 If you’ve been searching for a girls tool set for your child, you’ll want to consider this pink option. The bright pink colors are appealing to girls and encourage them to want to play with it. There are 11 tools available that have been made using durable steel materials to ensure that they can last for years. We liked how they’ve been made with an ergonomic design as it’s more comfortable for girls to hold onto. The hands-on playing aspect is also fantastic for developing your little girl’s hand-eye coordination and motor skills. They also have a blast using the set to play creatively due to its realistic design. This is an awesome set that allow girls to play creatively while developing their motor skills and hand-eye coordination. Children have been having a blast with this back back tool set because it comes with a range of 23 tools to keep them entertained for hours at a time. It includes toy screwdrivers, wrenches, pliers, hammers, saws, and more. We liked how they have made these tools with a realistic design as it makes the playing experience more immersive for kids. They’re able to use the tools to play in more creative ways. Furthermore, holding onto these toy tools and pretending to make things is a fantastic way to help your little one to develop their motor skills and hand-eye coordination. They can also easily carry the set around with them due to the back pack. Kids love being able to carry their tools around with them in the backpack and play creatively wherever they go. This is a great tool set that has been made for older children. This is because all of the tools have been constructed using high-quality steel materials to ensure that they’re durable. There are 10 pieces available that provide kids with plenty to play with. We also liked how they enable kids to experience what real tools feel like. This allows them to use them in more imaginative ways. We were impressed with how they have implemented an ergonomic design with these tools as well. As a result, your child is able to hold onto the tools comfortably which encourages them to develop their motor skills and hand-eye coordination. Children have been loving this set! The steel materials provide kids with a sense of what real tools feel like, which ensures that they have a more unique playing experience. 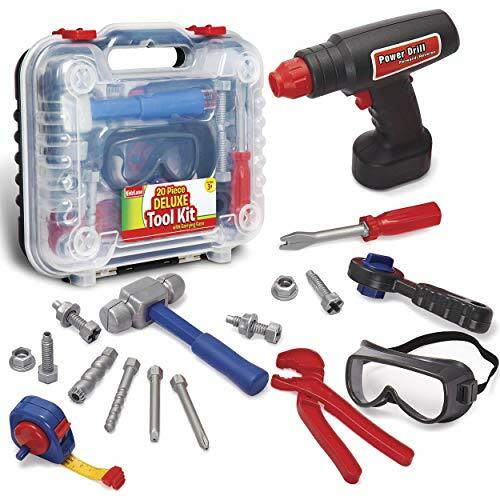 This tool kit is a fantastic option if you have been searching for something that your little girl can play with. It has been made with a great pink design that encourages girls to play with it. There is a range of tools available that have been made with steel materials. Therefore, we recommend it for older kids who are 5 years and over. It enables them to get the experience of what it’s like to use real tools. As a result, they have a blast using them to play with a lot of imagination. Furthermore, handling these tools is an exciting way for your child to develop their motor skills and hand-eye coordination. 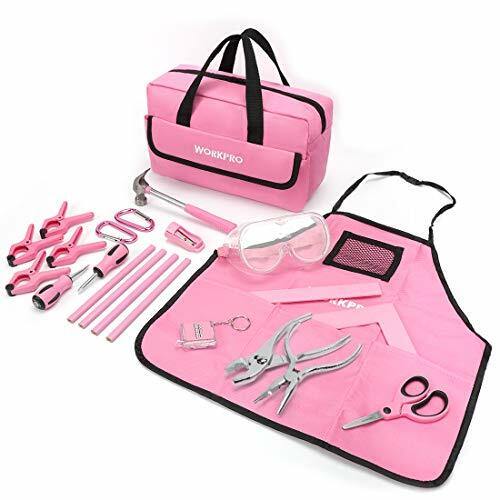 Girls have been loving how this pink tool set lets them experience what it’s like to handle real tools. Their motor skills and coordination are able to improve while playing with them too. Children are provided with 14 different tools to play with which includes a pretend tape measure, drill, bolts, wrench, and more. So, you can be sure that your child will be entertained for hours. We liked how they’ve designed these tools to look realistic. It inspires children to play with them in more imaginative ways and use their creative thinking processes. The materials used are also of a high-quality. Therefore, you can feel confident in knowing that this set will last your child for years. Moreover, while kids are handling the tools, their motor skills and hand-eye coordination are able to develop well. This is a great set for kids who want to be able to play creatively for years to come due to the durable materials. 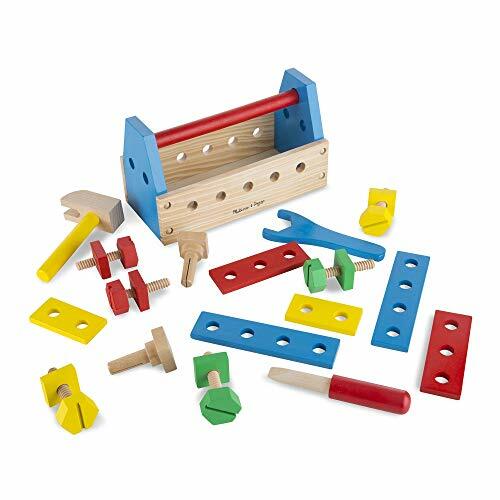 This kit comes with a range of 24 pieces that are made out of wooden materials. This provides your little one with lots of parts to play with and stay occupied for hours on end. The wooden materials are of a high-quality to ensure that they last your child for years of play. These materials have also been made to be safe for children since they’ve been put through strict standard tests. We also liked how the set involves a hands-on playing experience. This is because it allows children to develop their hand-eye coordination and motor skills. Not to mention, they’re able to use the set to play with tons of imagination too. This wooden tool set enables kids to play creatively for hours while improving their hand-eye coordination and motor skills. We liked how the tools in this set have been made with a realistic design as it provides kids with an incredibly immersive playing experience. For example, the trigger on the toy drill can be pressed which causes it to make sound effects. These are excellent interactive feature that can improve your child’s auditory learning senses too. Not to mention, it allows them to use the set to play with a lot of imagination for hours. The hands-on playing aspect means that you can expect your child’s motor skills and hand-eye coordination to improve greatly. Moreover, a storage case is available that lets kids carry their tools around wherever they go, making it a good toy for traveling. Children have an absolute blast playing with this set creatively and being able to take it around with them. So, that covers what the top toy tool sets for toddlers and children have to offer. You can now begin to narrow down your search to finding the set that you think your little one would enjoy the most. However, if you’re still not feeling 100% certain on which one to pick, don’t worry. We have created this buyers guide section to provide you with additional information to help you feel great about making a final decision. When it comes to buying play tool sets for toddlers and older kids, there are some factors that you should take into consideration. Since the age ranges are different, you’re going to want to be sure that you pick the right set for your child’s age. The tool sets for toddlers that have been mentioned in our review are made out of plastic materials. This is because they are a lot safer for younger children to play with and not harm themselves. As far as older kids are concerned, many of their options are also made out of plastic. However, there are a number of them that have been constructed using steel materials. This provides them with a different playing experience. Kids often watch how their parents use real tools and they want to imitate. The steel construction of some of these tool sets allows them to do just that. As a result, they’re able to have a more realistic playing experience, which is great for their creative thinking processes. After reading through our review, you will have noticed that there are a number of different types of popular tools that are available with these kits. If you wanted to learn a little more about these tools, take a look below. 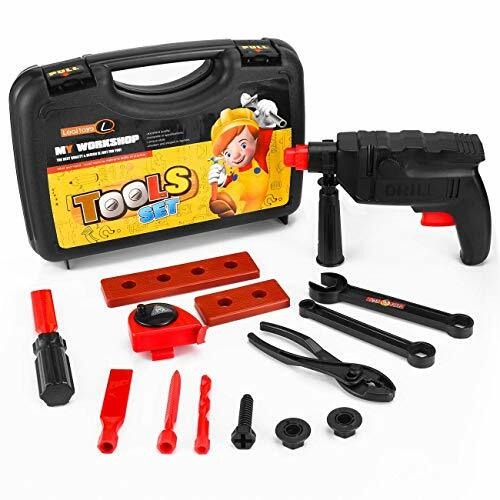 Many of the drills that are included with the child’s tool sets in this review are powered by batteries. This allows kids to press the button to turn it on and listen to the realistic sound effects that it makes. We found this to be an incredibly interactive feature that make the playing experience more realistic. There are even some toy drills that have a rotating function. These features are awesome for helping your little one to play with a lot of imagination. Pretend play saws are a lot of fun for children to use as they have seen how their parents use them to cut things with. Therefore, this tool toy tends to receive a lot of attention from children. Your little one is also able to develop their motor skills and hand-eye coordination while using the toy saws. The nuts and bolts that come with many of the play tool sets in our review are fantastic accessory items. They enable kids to feel like the set is more real as they’re able to tighten and loosen the various nuts and bolts. Screwdrivers are another one of the standard tools that you will find in the majority of children’s toy tool sets. 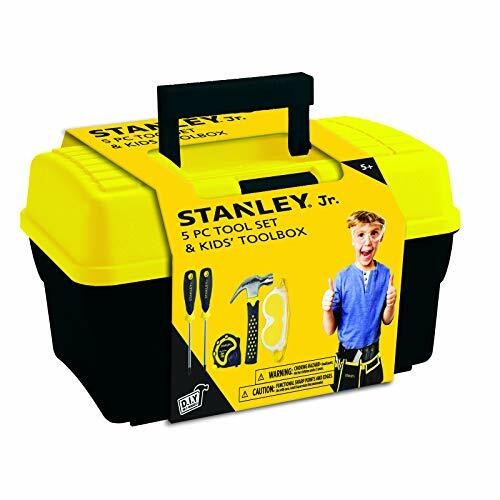 You will have seen that there are numerous brands that manufacture these kids real tool sets. If you were interested to learn more about the best brands, the section below is for you. Melissa & Doug is a well-known company that makes an enormous range of different toys that kids have been having an absolute blast with. They have a goal of making toys that help children to use their imagination. Therefore, their toys are excellent for improving your little one’s creative thinking processes. At the same time, their toys also help children to improve various skills, such as coordination and motor skills. Battat is a brand that realized childhood is about exploring and having fun. That’s why their toys are awesome for inspiring kids to play with more creativity. They were established back in 1897 and ever since then, they have been making toys that children can have fun with, while also having a beneficial angle to them as well. Therefore, kids are able to have fun while also learning and improving different skills. Learning Resources started out in 1994 and has been manufacturing high-quality toys for kids even since. The company grew at a rapid rate after they were able to come up with toys that allowed children to have fun while also learning. This is because it provided kids with a unique learning experience and parents liked how their toys made it such a seamlessly easy thing to achieve. They not make a wide range of toys that kids can use to play creatively with, while still benefiting from them at the same time. Kidami is another excellent brand that has been focused on making educational toys that are also fun for children to play with. The toys that they make are also of a high-quality too. Therefore, you can expect your little one to play with them for years to come. They also have a wide variety of different toys on offer which means you can be sure to find something that your child loves. So, that wraps up our review on what the top tool sets for kids have to offer. Be sure to read through the main features, pros, cons, age recommendations, and what makes each one stand out. 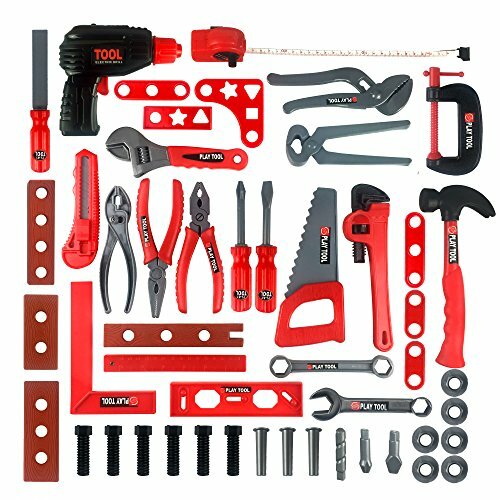 For a further enhanced experience you can pair any of these tool sets with a toy workbench, which children absolutely love. That’s what will provide you with the best idea of the one that your child will enjoy the most. The age recommendation part is important to make sure that you pick a set that’s appropriate for a toddler or older child. Our buyers guide section also includes some additional information that will have you feeling awesome about making a final decision!